TOKYO—Yokohama Rubber Co. Ltd. has taken an asset impairment charge against its third quarter earnings of $102 million to account for a reassessment of the profitability of and business outlook for its truck tire manufacturing unit in Mississippi. In a statement on the situation with Yokohama Tire Manufacturing Mississippi L.L.C. 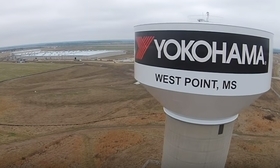 in West Point, Miss., Yokohama said: "Achieving profitability at the subsidiary has taken longer than management anticipated when production began there, and management has recorded asset impairment in accordance with a prudent reassessment of the business outlook for the subsidiary and of the outlook for recovering investment there." It did not elaborate beyond the statement. The 1 million sq.-ft., $300 million plant opened in 2015 and today employs 665. The plant is rated at 1 million tires a year. YTMM dismissed 29 employees this summer because they did not meet "pre-employment requirements." Separately, Yokohama cited this charge as one of the reasons it is downgrading its earnings outlook for fiscal 2018.